Today we are rolling out our newest and most exciting feature so far. Bid Alerts is a free tool designed to protect your eBay listings. 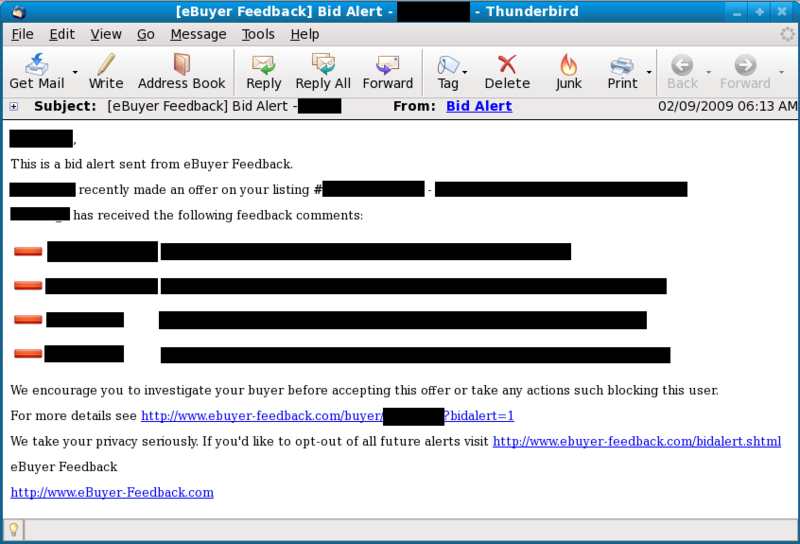 With Bid Alerts you will know instantly when someone bids, purchases, or makes a best offer but who has also received non-positive feedback at eBuyer Feedback. Within 2 hours of our internal launch we had already begun seeing alerts generated. We encourage everyone to sign up today. Here we show a sample Bid Alert that was generated during our testing phase. This was generated due to a best offer being submitted to one of our registered sellers.